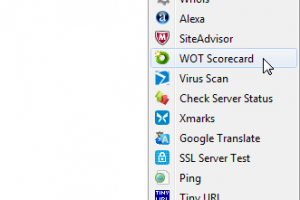 View the country of website's server"
If you’re a Firefox user and you need a way to find the geographical location of a website server, then this is the right tool for you. This piece of software is particularly useful because even if the domain name provided by the website indicates a country, this app will show you what the real information is. What’s more, once it detects the nationality of the site, it will display an app right next to the URL. If you’re looking for a reliable application, this one is it! Because it’s based on an internal database of IP addresses that are updated continuously, you can rely on it to be precise about the information it provides for you about the websites of your choice. 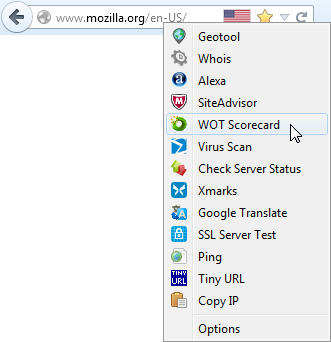 This extension, once installed on your Firefox browser, will allow you to access this information with just a click. Once you click on the icon of the extension, the geo tool will be opened, and you will be able to view a detailed map with the location, including country, region, city, and more. The IP address and ISP will also be available for you. What’s more, the extension can be configured however you see fit, and it includes features such as URL parsers, lookup tools, and a lot more. Flagfox for Firefox is licensed as freeware for PC or laptop with Windows 32 bit and 64 bit operating system. It is in mozilla extensions category and is available to all software users as a free download.